The first step in any carving - long before putting hands to wood - is research and the collection of as much reference material you can, including observation of the living creature wherever possible. We all know that birds come in different sizes, as do humans, but in this decorative art form we tend to work to common sizes within the species, and carving decoratives have to be millimetre perfect. Not only does drawing a plan allow you to ensure that you will capture the essence of the species when you carve it, but it also allows you to use callipers and dividers to confirm that the measurements of the carving are correct at all stages of the process. 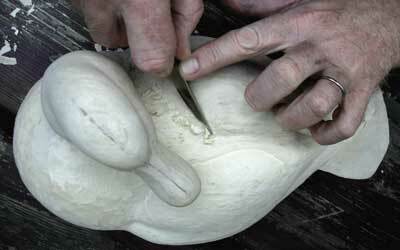 As I carve my birds in one piece - often heads are carved separately - I cut a very basic shape (see picture 1) using the bandsaw. This bird was carved in tupelo wood (Nyssa spp), the bulbous trunk of the tupelo tree which grows in the swamps of Louisiana and Carolina, because the finished bird was going to be floated in competition. 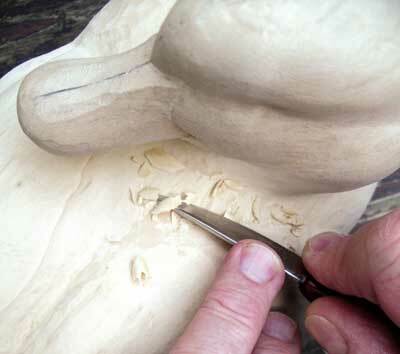 I then start to mark out the exact head angle and details, and the process of carving starts. 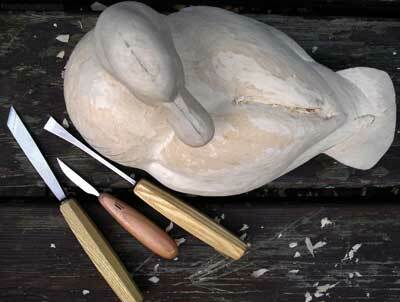 I don't use power tools - I'm creating a sculpture in wood and like to feel it coming to life as I carve. The important rule is to: think, check it, check it again, and then carve! I keep working round the bird to get the rough shape. I then return and refine and refine to get the finished shape, always working round all areas and not concentrating on getting too much detail in a single area (see picture 4). When I'm happy that the shape of the sculpture is correct, I move on to the next stage, defining the feather groupings. 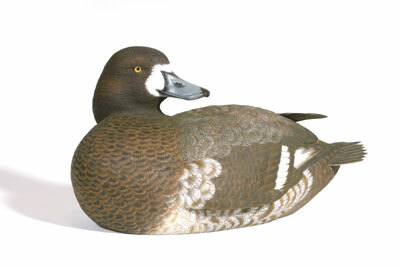 The Greater Scaup is a diving duck, and diving ducks have very different feather shapes to puddle - otherwise known as dabbling - ducks. This is where reference material is invaluable - if you can examine a feather you can reproduce the shape and layout correctly. Try this if you can. Pick up a feather and look at it. See how thin it is and how delicate the feather splits are. Also, feathers have a curvature and this must be carved in. It's also important to remember that you are only seeing the end of the feather when you view them on the bird. You must take into consideration how the complete feather lies,especially when you come to the painting stage. Once all the feather groups are drawn in, I use diamond bits and stones in a small power grinder to form the feather shapes (see picture 5), and then go through the process of sanding the feathers down with different grades of sandpaper to get a real smoothness of finish. I do all my sanding by hand. As feathers have shape and form we have to ensure during the sanding process that this doesn't leave any flat spots. Once everything is sanded through the different grits of sandpaper, I turn the paper over and rub the bird all over with the cloth backing. 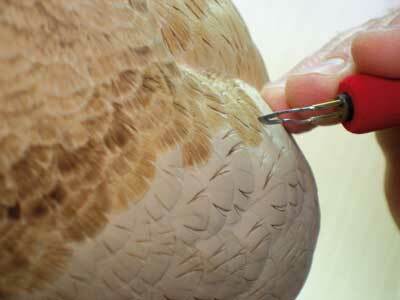 This almost burnishes (polishes) the wood to a really hard surface with no 'fluffy' bits, which ensures nice crisp edges to the feathers, even in the little troughs where one feather meets the other. This is the finest level of sanding that can be achieved. 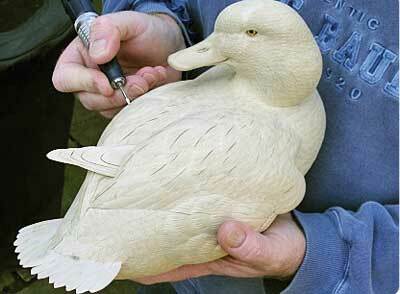 It is important to remember that when viewing a wildfowl carving, your eyes always go straight to the head, so getting this right can make or break the carving. The eyes are set in first, and then I carve the eyelids, then the individual feathers, and finally complete the texturing process. 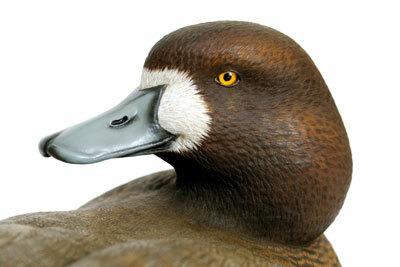 I use taxidermy class blended glass eyes - see the shading around the outside of the iris in photo 6. Once the eyes have been inserted it is all too easy to scratch them, so it is sensible to get a little piece of duck tape or similar and stick it over the iris to protect it. Once every little head feather has been carved in using various diamond burrs and shaped stones in the power grinder, I go over them with the hard white ceramic stone (see picture 6), which gives the tiny grooves that make the first level of texture. The second level of texture will be applied later with the burning pen. When the head is finished, I soak the bill in Superglue because when it dries I can use the finest of grits of paper to sand it down so that when the paint is applied, it looks like membrane, which is what the bill is made of. Now the texturing process starts. When the feather groups are carved and sanded, I burn in the quills which give the direction of the feathers. 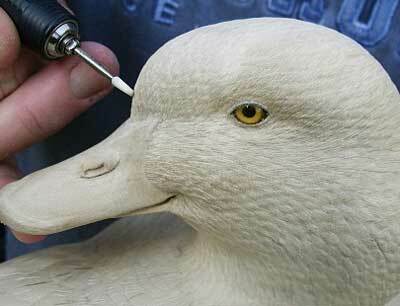 The best thing to do is to lightly mark out the quills with a pencil to determine the flow of the feather. 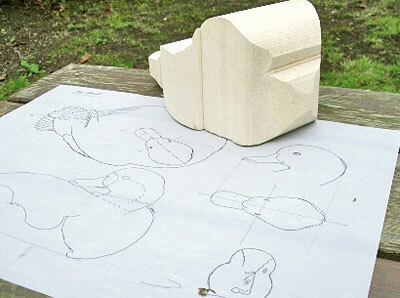 Next, plan out where all the splits go, adding detail to the carving. 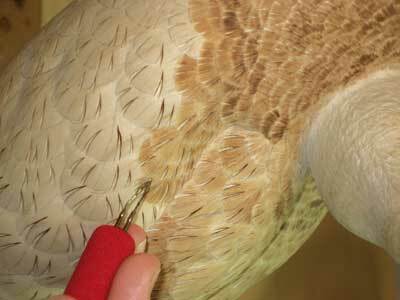 Remember that the feathers are very, very thin - it's important to be aware of this when carving the split in to give interest. I use Optima burning pens (see pictures 7-9). They are the finest you can get in terms of the thickness of the steel. When they are new, I burnish the edge on a piece of wet and dry paper before I use them for the first time. The reason I do this is that the sharper the burning pen, the lighter the touch can be on the wood. The biggest mistake made by anyone when texturing with a burning pen for pyrography is that they burn too dark, too deep and too hot. Rule Number 1 is to get an off-cut of the wood you are working with and test your pen. Use it gently. Don't apply pressure - there should only be a very light mark. 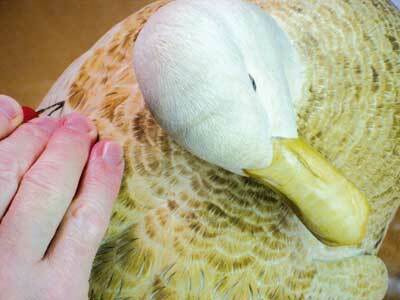 The depth of burn is very important, especially if you are going to be painting white feathers. It should be really light to the touch and very crisp. It is important to remember that when making the burn mark, it is making a 'V' in the wood. If this is too deep, it will be necessary to try to mask the burn with a lot of gesso primer to try and hide the burn before painting, which will then fill up the cut and destroy the required effect. I also regularly wipe the pen on a piece of wet and dry paper to remove any sap. Remember, while applying the feathering with the burning pen, the wood was a living thing and there will be different densities in a single piece, however stable the wood is. This means that in some areas you find slightly harder or softer spots, and this will affect the burn (see picture 9). Because of the sanding and finishing techniques I use, I don't use gesso before I start painting. I use a mixture of three parts cellulose thinners to one part cellulose varnish as a sealer and then I paint the colours straight on to the bird. For the finished painting I have used both oil paints and acrylics but not mixed, obviously! The darker, richer colours, the head and the breast, are painted in oils - they give you a far richer depth of colour. All the lighter tones, the vermiculation and the whites, are painted in acrylics which are far more opaque than oil, so you can put in all the little feather tips and details. I use an airbrush for some of the base coats because it allows me to get the blends really soft as I move from one colour to the next, and then all feather detail is put in with a very fine brush. The final touches, after all the painting has been completed, is when you remove any traces of paint from the eyes, and then the bird really does come to life (see picture 10). "I do not use power tools - I am creating a sculpture in wood and like to feel it coming to life as I carve"
- To reach into small spaces, I make up various types of flexible sanding 'tools' - sandpaper stuck with double-sided tape on each side of the blade of a palette knife (different knives with different grades of paper) or stuck on flat lollipop sticks. I have even cut up an old rubber 'flip-flop' and stuck sandpaper on both sides of the individual pieces! - When working with Superglue on the bill, it is important to put a cloth underneath it to ensure the glue doesn't drip on to anything else that has been done!